Scapple doesn’t work like your usual piece of software. Rather than helping you handle standard computer tasks like editing photos or organizing spreadsheets or balancing your checkbook, Scapple takes a more holistic approach. Indeed, Scapple wants to help organize your thoughts. From the makers of the popular word processing-task management program Scrivener 2 for Mac and Windows, Scapple (now just $9.99 from TNW Deals) will help you turn good ideas into great ones. Got a project you’re noodling over? Just start jotting down notes on Scapple’s freeform, type-anywhere canvas…and before too long, your assignment begins to take form. You’ll start adding arrows and connections, tying one thought to another in a broadening portrait of a project heading toward completion. You can move items independently or in groups, highlighting and reorganizing as you go. Before too long, your seemingly unconnected ideas begin weaving themselves into a unified, cohesive mosaic. 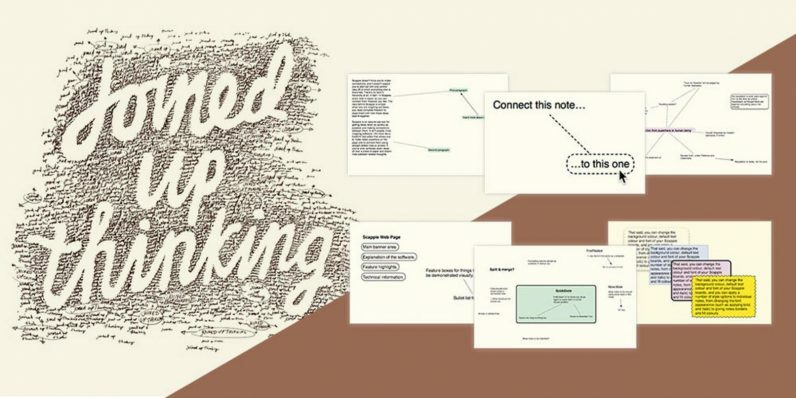 As you follow along your mind-mapping adventure, you can incorporate images and graphics, all easily shareable not only within your project frame, but with others you invite into the collaborative process. With Scapple, information morphs and shapes itself into whatever form you think and feel. Whether you’re a Mac or Windows user, there’s a Scapple version for your operating system. Right now, you can try out Scapple at a third off its regular price, only $9.99.